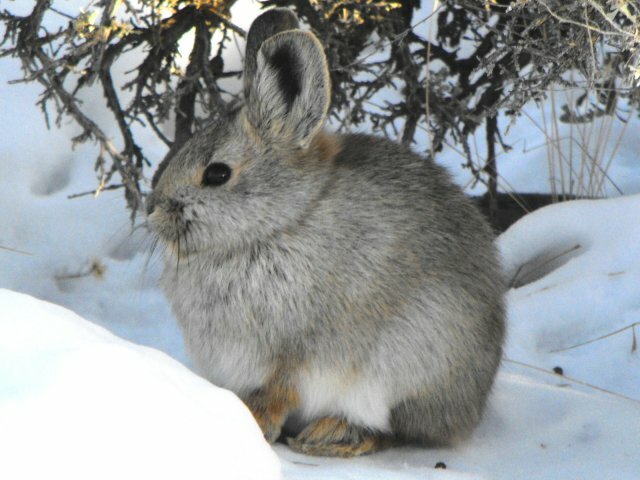 Pygmy Rabbit ; Summer or winter, water is scarce in the Great Basin, and there is only one animal that has fully adapted to this harsh environment: the pygmy rabbit. The pygmy rabbit is known for being the smallest rabbit in the world, barely the size of a soda can, but is also one of the most resourceful survivors of the the valleys. Due to its size, however, the pygmy rabbit is the target of almost every predator in the valley, including: weasels, hawks, owls, coyotes, red foxes, and badgers. Roughly 88% of these tiny rabbits are killed from predation, especially in the winter season. The rabbit lives largely on sagebrush during the extreme seasons. Sagebrush contains a tiny amount of water in each leaf, and although it takes serious work, if the rabbit eats enough of the plant, it has no need to drink.